When deleted files, you can't access them without a third-party software tool or command because they become inaccessible. Their status are different from normal files. For different operating systems, the solution varies. If you're using DOS system or you can reboot your system into DOS system, you can recover deleted files without downloading and installing anything. Just use the "undelete" command and your deleted files will be recovered quickly and easily. If you're using a computer with operating system rather than DOS, like Windows 2000, XP, Vista, 7, or Windows 8, then there is no such undelete command. But you still have a chance to get back your deleted files. 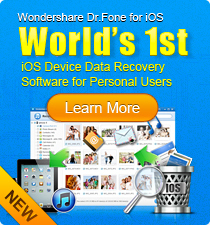 And the most effective way is to download data recovery programs like Wondershare Data Recovery. After installing, it only reads your data and it's risk-free and safe to perform data recovery. Keep in mind that before those deleted files are recovered, stop putting more files to your computer especially the drive which you deleted files reside. Your deleted files could be overwritten and lost permanently. So install the software to an external hard drive if possible in case writing any data to your computer, even a data recovery software. Now I'll show you how to recover deleted files without the undelete command. Prior to that, you need to know about the syntax of this recovery command and the explanations of its options. Below is the command you can type and get back your deleted files without downloading any software. It'll recover all files that may have been deleted in the specified directory. Easy to use, right? You can do more with the following options. /all Recovers all files specified automatically. /list List all recoverable files, but not recover. /DOS Restricts the recovery to those files that meet the file specifications in the disk directory table. /DT Restricts recovery to files within the Delete Tracking File. /DS Restricts recovery to files within the SENTRY directory. /load Loads the undelete program into memory using information found in the UNDELETE.INI. /unload Unloads the memory resident portion of the Undelete program from memory. /purge[d] Deletes the contents of the SENTRY directory. /status Displays the delete protection present on the computer. /S[d] Enables the Delete Sentry level of protection and loads the memory resident portion of the UNDELTE program. Unfortunately, the undelete command is unavailable in Windows 8, Windows 7, Windows Vista and other OS newer than DOS. 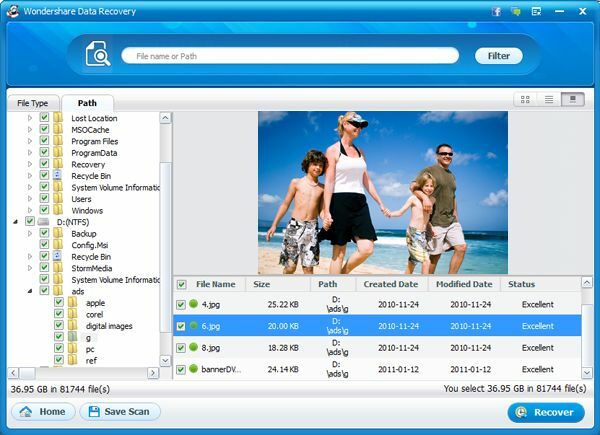 You need a file recovery software to undelete files. 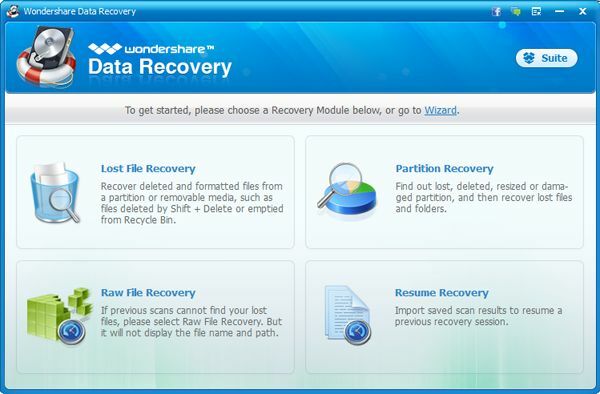 Below are the easy steps to recover deleted files with Wondershare Data Recovery software. Run the software after installation. In the main window, select Lost File Recovery. Next, you need to choose the drive you want to recover the deleted files from. This mode will scan your drive quickly and recover files without losing their original names. Without a long time, all recoverable files will appear in the list. On the left, locate the folder your files reside, or directly type a keyword in the search box to find it quickly. You can also recover deleted files using format filter. After scanning, the results will display in categories and formats. 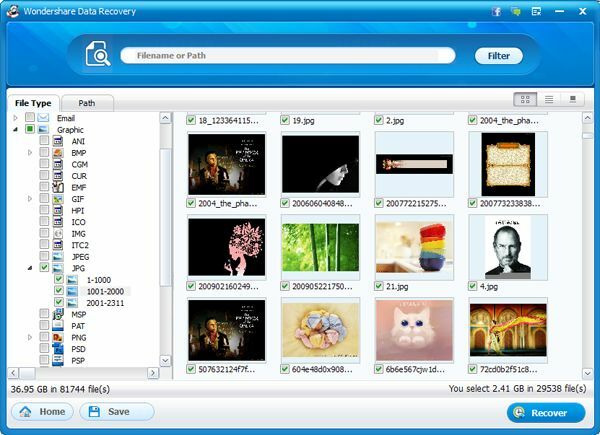 To recover found files, check them first and then click the Recover button at bottom. All the files will be recovered at its original quality.